She was blonde, about 18 and dressed in an eighties style, retro red fleece tracksuit trimmed with cream cuffs. Desperate to flaunt her incongruously unnatural, deep mahogany solarium tan, she had hiked up the top, allowing one shoulder to fall ‘Flashdance’ style revealing a little singlet top, and she had rolled down the waistband of the tracksuit pants to the point where it grazed her Mons Pubis. It was clear that she was a fan of Brazilian waxing. But I had the creepy feeling that her pants could fall down at any moment. Like an accident waiting to happen, I struggled to look away, as did most of the people sitting alongside me in the cafe seating of the bakery. I silently wondered whether she was a King Street 'Entertainer' and pondered what would lead a young woman to that path in life. Sadly her pronounced hip bones betrayed the fact that any solids she ate probably moved her to 'drive the porcelain bus' and that perhaps most of what she ingested entered her body via the nasal cavities. Her lank hair was dragged up into a messy ponytail. Multiple bangles circled her bony wrist and most of her face was shielded by an enormous pair of dark sunglasses, marked with emormous Gucci logos. I figured that she was probably trying to channel Nicole Ritchie or one of those prevalent rich, self-centred bimbo’s who populate the weekly trash mags. She dragged her short verdigris coloured fingernails across the glass counter of the Patisserie selection. Looking at all the culinary wonders below, she could breathe in the beauty of the pastel coloured macaroons, the elegant French cakes that looked like exotically coloured and patterned couture gowns, fluffy custard filled beignets - aka bomboloni - with the sunlight glistening off their sugary coatings, large mousse & cake filled chocolate domes, substantial and lavishly filled baguettes and a parade of buttery pastries. Behind the counter a dainty Mauritian girl, with skin as smooth as the bakery’s fine, hand made chocolates and as pretty as any of the offerings under glass, stood with her back to a wall of freshly baked artisanal loaves of bread. She glistened proudly in the reflection of the wonder around her, smiling broadly and expectantly. Strung out, vacuous customer: "…ave you got croyst-zants?" "Oh Croissant?" She replied with a perfect French lilt. "Yes. Would you like plain, chocolate or almond?" The subject of my fascination chose a plain croissant, then scuffed her way out to a kerbside table. A cigarette was quickly lit and, after the first drag she buried her head in her hands. Her spiky haired blonde boyfriend in the skinny jeans and clunky multi-hued retro sneakers – who I suspect was modelling himself on an early version of Jon Bonjovi - enthusiastically ordered a pile of food for himself and bounded over to her at the table, looking contrastingly fresh and happy. Meanwhile my own croissant arrived. To me the simple, buttery marvel of a croissant, is one of life’s simple pleasures. This particular specimen was golden, crisp on the outside, multi layered, subtly sweet yet savoury and slightly chewy inside. As I pulled it apart I swept up the flaky crumbs with one finger and inhaled them. The first piece of pastry melted on my tongue. The second chunk was dunked into my bowl of French hot chocolate, made not with cocoa but shavings of dark couverture chocolate. The croissant did not disintegrate into the milk, an excellent sign of quality ingredients, but absorbed just enough flavour to make my head spin with rapture on tasting. I slowly stretched out my consumption so that I could enjoy it for the longest possible time. I hoped the girl outside was enjoying hers as much as I was mine. Simple unadorned, buttery heaven in a pillowy soft crescent. A moment's solace perhaps in a life confused with unreal expectations of the feminine physique. So welcome to Noisette, my local Boulangerie and Patisserie(Bakery & Pastry Shop), the place where I find inspiration and respite from my schedule. The Owner and Patissier at this particular venue is a fifth generation French Baker. I've been told he had moved to Australia a number of years before, to head up the sweet operations for another more volatile and entrepreneurial French Baker, who has a big local chain of French Patisseries. Fortunately for me when David Menard tired of the restrictions and tantrums of his boss, he opened his own place around the corner from my little house by the sea. Compared to the chain he had previously worked for, his own place is modern and simply decorated, not a throw back to bygone Paris or Brittany, but an ode to the meeting of the old country and the new. At the back of the shop a huge window opens on to the bakery and the industrious machinations of he and his white clad baking staff are on display to all those who can tear their eyes away from the people watching on the street outside. The shelves are filled with organic sourdough, Pain de Mie, Miche and all manner of sumptuous breads. Then there are sweet little hampers, small cellophane bags of tempting morsels, a large jar of fresh Marshmallows and jars of Bonne Maman jam. Facing the door, a section of the counter is filled with handmade chocolates from another of my favourite venues, Cacao. I love watching the crowd here. It changes and evolves at certain times of the day. In addition to the spoilt young adults and attention-seeking tots lying on the floor blocking the path of the staff, there are those who race in breathlessly and come out clutching artisanally crafted bread rolls and loaves of bread. There are men in Lycra road cycling ensembles replenishing spent energy and lovers sparkling in the rosy glow of their desire. On busy days the regular posers hog the outdoor tables, while the beautiful thirty-to-forty something design oriented couples take time out indoors. The middle aged middle class sip genteelly - and annoyingly - on the one cup of coffee for hours, oblivious to those who miss out on a seat, while an endless stream of conversation pours out of them. It's certainly a convivial spot. Last time I was there a couple beside me were meeting with a Marriage Celebrant. And then amongst the regulars there's me. I like to steal down there on my own or to hold work meetings there. I will drag a small production crew or my favourite clients out of airless boardrooms and over to the patisserie for our discussions, filling the table with sugar spun miracles. Time passes more quickly when surrounded by the smell of baking highlighted with aroma of perfectly roasted coffee. It unearths an instinctive joviality that lubricates communication with laughter and works a minor miracle on the soul. But mostly I'll steal in there at the end of the day when it's quiet, for a Palmier and a coffee before facing my last hours of work and then retreating to the kitchen to make our evening meal. 84 Bay Street, Port Melbourne, Victoria. My mouth is dry, my throat crackles and I have no palate. Still. Cooking is crap. I feel unispired and can barely taste anything that lands on my tongue. So heaven knows what I am subjecting Mr Stickyfingers to when I cook. Last night I ate some spicy fried chicken. It may as well have been a wedge of cardboard, but for the chilli that I could still feel on my tongue. I could not taste it. I could conceivably live on frozen convenience foods in this current state. Now I know what it is like to be a 'non taster'. Now I understand why there are people who just consider food to be fuel and are not bothered much about eating. Now I see why some people can be really skinny. Without flavours to look forward to, I actually don't feel like eating. I hear myself saying, 'I don't feel like eating, but I know I must'. I can't believe that I have been saying it, but this is what I'm reduced to. Yes, I have to eat. My hormones are screwed and my body makes too much insulin. So I have to elevate my glucose levels to prevent myself from falling into a coma. I can only do this by grazing on slow burning/low GI carbs and protein, and exercise, exercise, exercise - not that it will make me slim, but it stops me from becoming morbidly obese. I'm so frustrated. Perhaps were I a certain chef, a torrent of expletives would follow. The fall back position when your tastebuds are crippled is fast food, or perhaps in my case, fast and classic, yet healthy and ethical. 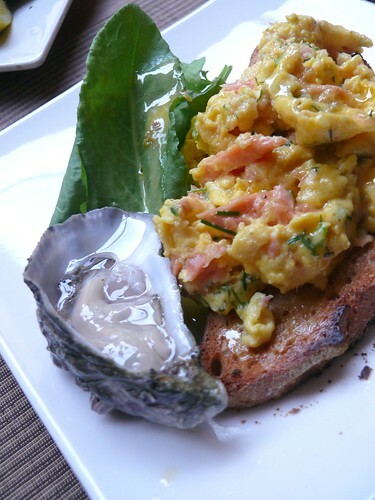 I know that my palate is not so necessary to make the basics, so when Mr Stickyfingers completed his exhausting 14km charity run on Sunday - Run For The Kids - I shucked Smoky Bay oysters and prepared some eggs on toast. It was not extraordinary, but I was assured it tasted good. Smoky Bay is in South Australia. 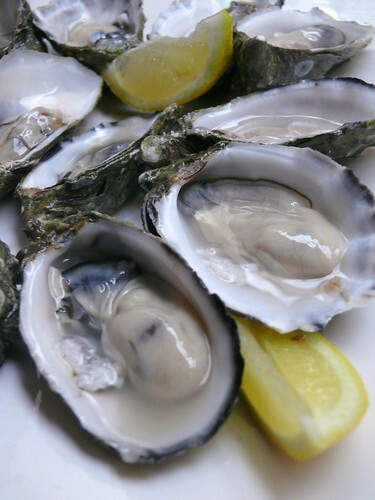 The sweet tasting oysters are one of my favourites. The eggs are the Traditionally raised ones from Swampy Marsh as usual, down Warrnambool way. I scrambled them with Smoked trout from Butts of Albury and tossed in some Meredith Goats cheese with dill and home grown chives. The bread is from the wood ovens of The Convent bakery in Abbotsford and we slurped down some cheap French bubbles, which also went into the Beurre Blanc that I sloshed over the eggs and some fresh sorrel. Fast and fresh. 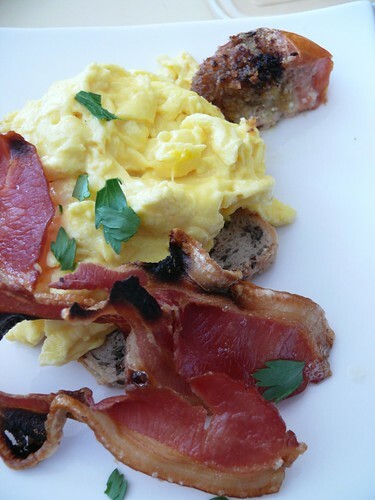 Of the two proteins that make up eggs, the white cooks fastest. For room temperature eggs that means that the whites firm up around the fifty degree centigrade mark. So if you want gooey scrambles you need to cook them over a very low heat. For extra creamy, smooth eggs, you need to add almost as much cream by volume as the eggs. This also helps to stop the eggs from coagulating too fast. Do not overload your pan. You are better off making two portions at a time than to try to feed the whole family out of the one serve. To scramble eggs, melt a generous amount of butter in a medium sized pan over low heat and then add the eggs, loosely mixed. As the edges start to firm up use a spatula to lift them back into the centre of the pan, continuing until your eggs are close to the desired consistency. 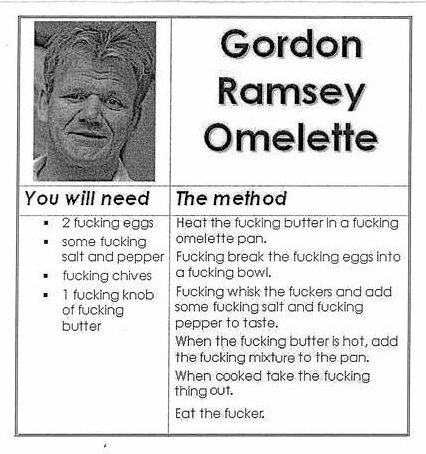 This way you are also pulling the whites through the yolks. Do not be tempted to turn up the heat. If adding extras like smoked trout & goats cheese as I have, put them in next, and gently distribute through your eggs. Remove from the stove before the mix is completely firm. The eggs will continue to cook a little longer off the heat.